Rhesus macaque B7-H5, His tag (B75-C5220) is expressed from human 293 cells (HEK293). It contains AA Phe 33 - Thr 192 (Accession # NP_001177807.1). The protein has a calculated MW of 19.9 kDa. The protein migrates as 35-45 kDa under reducing (R) condition (SDS-PAGE) due to glycosylation. Rhesus macaque B7-H5, His tag on SDS-PAGE under reducing (R) condition. The gel was stained overnight with Coomassie Blue. The purity of the protein is greater than 95%. 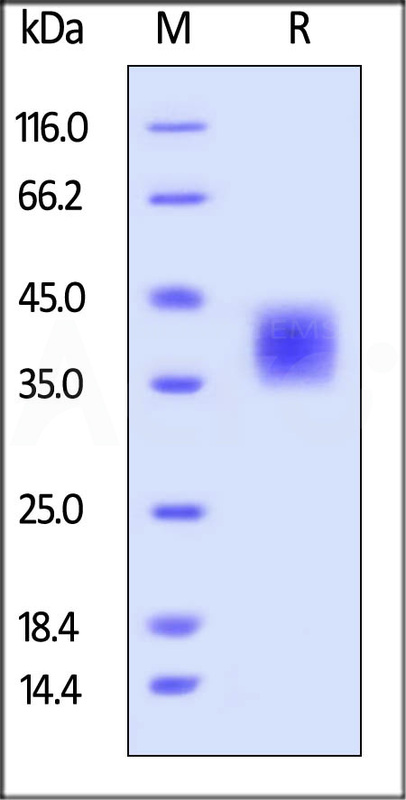 Platelet receptor Gi24, also known as B7-H5 and stress-induced secreted protein-1 (Sisp-1), is a protein that in humans is encoded by the C10orf54 gene, which contains 1 Ig-like (immunoglobulin-like) domain. As for C10orf54 gene, C10orf54 appears to positively interact with BMP-4, potentiating BMP signaling and the transition from an undifferentiated to a differentiated state on ESCs. Human C10orf54 undergoes proteolytic cleavage by MT1-MMP, generating a soluble 30 kDa extracellular fragment plus a 25-30 kDa membrane-bound fragment. (1) Sakr M.A., et al., 2010, Cancer Sci., 101: 2368-2374. (2) Mayya V., et al ., 2009, Sci. Signal., 2: RA46-RA46.